Sydney – She has had fun making some outrageous head pieces out of paper that she has been attaching to her headbands to wear (i.e. a crown, a large bow, cat ears, etc). Pictures to follow. Right now she is learning to play the Minuet in G by Bach (for her Spring recital piece) and I am a Child of God (she is going to accompany us at our next Family Home Evening!). We are in the process of figuring out how to post MP3’s to our blog so you (mostly meaning Grandma) can hear Sydney’s last few recital and Christmas piano pieces. Isaac – I started teaching him piano lessons this week. And the rule in our house is when you start, you don’t stop until you move out of the house. So far he loves it! Since he’s only 4 1/2 we don’t just sit at the piano and practice for 30 minutes. Instead, we switch between the piano, his activity book and some percussion instruments that he absolutely loves playing with. So far he knows Left hand, Right hand, quarter notes, quarter rests, loud f, soft p, groups of 2 and 3 black keys, C, F, high notes, low notes, middle notes, and reading music from left to right. I am doing a combination of Music for Little Mozarts and The Music Tree (which is my absolute favorite piano teaching method). Last night right before I started teaching piano lessons, Isaac jumped off the bottom step onto the landing area and cut himself under the chin pretty good. I knew it didn’t need stitches, but it sure needed a lot more than a Band-Aid so he sat on my lap holding a wet wash cloth on it for about half an hour while we waited for Peter to come home with the appropriate bandages. Isaac is all better now but insists that the bandage will need to stay on for five days. Peter – He has been mostly in town for the last four-five months and we have all enjoyed having him home (most of all Peter I’m sure) but the busy travel schedule is coming again starting next month. Work is keeping him very busy, as always. He has been very frustrated because his department has been trying to hire about 17-20 qualified people for the last year, but beurocracy and politics keep getting in the way. So… that means my husband is busier than he wants to be. Peter recently applied for a job in the UK teaching physics to Royal Air Force cadets and we are waiting to find out if we will be going or not. We love living in Florida (except that there are no mountains, no snow, no family, no Temple Square, no canyons, no walking to church, no driving for 30 minutes to get completely away from PEOPLE, etc) but his job is very stressful for him and a change would be very welcome! Liz – I had a little incident with a tomato and a serated knife a couple of nights ago while preparing the fixings for nachos. You can probably guess who won. My thumb didn’t even stand a chance. It seems to be doing fine but I am still waiting to find out whether the skin is coming off or if it was a deep enough cut to re-attach itself. I probably won’t keep you posted on this. I will just say that it is not a smart thing to try to play the piano right after taking a bandaid off of a recently cut finger – it’s not worth the blood on the keys. Right now I’m just busy with my kids, with teaching piano, reading a couple of books, grocery shopping, doing laundry and most obviously, blogging. That’s all folks… Until next time…. 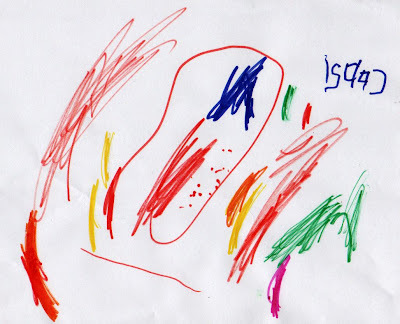 Here is Isaac’s very colorful picture. I didn’t have time to ask him what the picture is about, but you can see he wrote his name on it! We are reading The Magician’s Nephew by C.S. 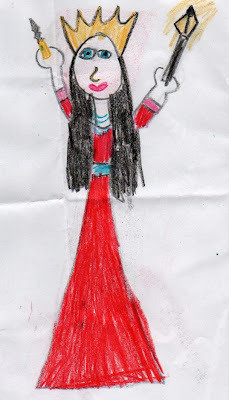 Lewis (from the Chronicles of Narnia series) right now so Sydney drew a picture of Jadis, the queen of Charn who later becomes the White Witch. In her left hand, she is holding the lamp post that later becomes planted in the ground in Narnia. *Special thanks to Peter for being our page turner.